“Arborists on the Mall,” Histories of the National Mall, accessed April 22, 2019, http://mallhistory.org/items/show/495. 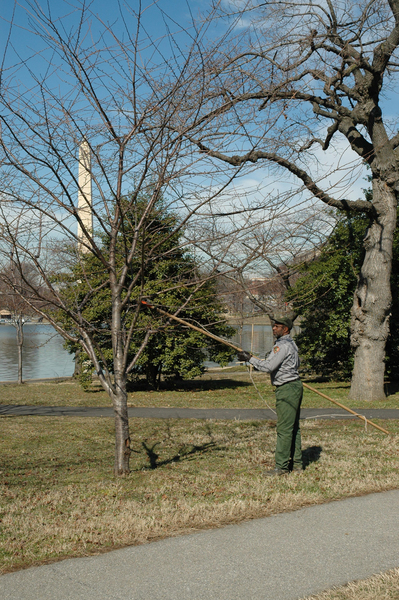 The National Park Service employs a team of professional arborists to ensure the continued health of the Mall's 9,000 trees. Sometimes known as "tree doctors," the arborists care for the cherry trees along the Tidal Basin, which have been a fixture on the Mall since 1912. Without their hard work, the centerpieces of the annual Cherry Blossom Festival might not exist. The Mall’s trees are beautiful, but they also serve another important function: removing air and water pollutants from the city and Chesapeake Bay watershed.